Remembering Great Apes is the third book in the highly acclaimed Remembering Wildlife series of charity books and has been edited by Ian Redmond OBE and features a foreword by Dr Jane Goodall, PHD, DBE. 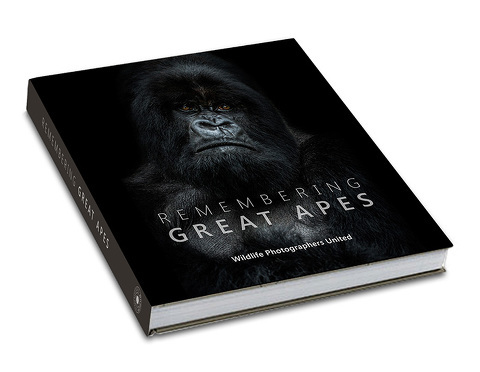 The book is full of beautiful images donated by 72 top wildlife photographers including Tim Laman, Anup Shah, Art Wolfe, Jonathan & Angela Scott and Michael Poliza, with an aim to raise awareness of the plight facing gorillas, chimpanzees, bonobos and orangutans and also to raise funds to protect them. For a third year, our charity partner has been The Born Free Foundation. A hugely successful Kickstarter campaign, raised £126,630 back in March, which helped fund production of the book. Thank you so much to all who backed our campaign and helped Remembering Great Apes reach its funding goal! The book was successfully launched on October 15th 2018. Please click here to order your copy or here to subscribe to updates. Our launch event was held on Thursday 18th October at London's Royal Georgraphical Society along with a free two-week exhibition of images from the book. So far, at least £100,000 has been raised through these initiatives and through book sales. Our book this year is generously sponsored by PhotoGuard photographic equipment insurers. The first edition of Remembering Rhinos book launched on 30th October 2017. Order your copy now and help support the plight of these beautiful animals.